Back in August, we reported that CBS is moving forward with a new TV series based on the 2001 hit movie Training Day, with original director Antoine Fuqua coming aboard to executive produce and direct the pilot episode. We haven't heard much about the Training Day series since then, but today we have a report from Deadline which reveals the network has approached Ethan Hawke to reprise his role as Jake Hoyt from the original movie. A deal isn't in place at this time, but the site reports that talks are currently happening. If Ethan Hawke does in fact sign on, he will have either a supporting or recurring role as LAPD detective Jake Hoyt, although the producers had originally envisioned the actor coming back in a starring role. The original movie starred Denzel Washington in his Oscar-winning role as Alonzo Harris, who spends his day "training" Jake Hoyt in his first day as a detective in his elite unit. Ethan Hawke earned an Oscar nomination for his performance in Training Day, which earned $104 million worldwide during its 2001 theatrical run. The TV series is reportedly set 15 years after the events of the movie, centering on a young African-American officer named Kyle, who is tasked by the Deputy Chief to go undercover within one of the LAPD's elite squads, in order to take down a crooked white detective. In order to gain the detective's trust, he is assigned to be his new partner. This new report also claims that there have been two different versions of the pilot script, written by Will Beall (Gangster Squad). In the first version of the script, the corrupt detective is actually Jake Hoyt. This was written specifically to try and land Ethan Hawke, but the actor reportedly wasn't interested in playing a crooked version of Jake. A new version of the pilot was written, which was given the green light, and features a new character named Frank who is the crooked detective, while Hoyt has risen to Deputy Chief. The pilot episode reportedly addresses the fate of Alonzo, who was killed at the end of the original movie. Ethan Hawke is reportedly more interested in making occasional guest starring appearances, similar to how Bradley Cooper comes back and guest stars on CBS' Limitless. However, the Deputy Chief role is being conceived as a more regular presence on the TV series. Negotiations are still under way, but as of now, both sides are far apart, so we'll have to wait and see how this plays out. 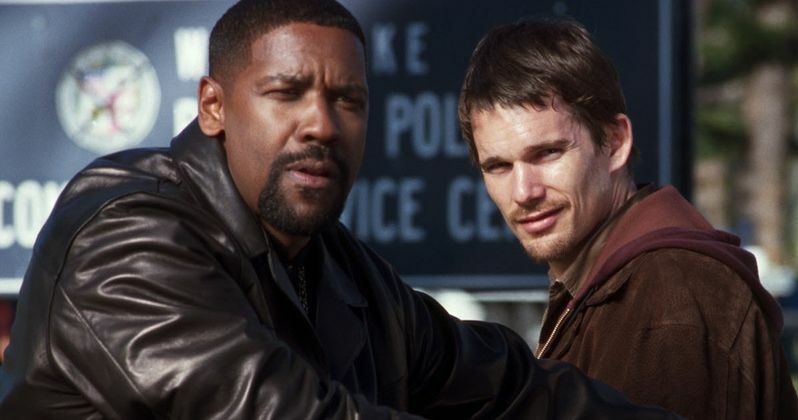 Would you like to see Ethan Hawke return for Training Day?